DAVID SADLIER, tenor, has been praised for both his vocal and dramatic abilities and hailed as “one of America’s leading dramatic tenors” (Oxford Mail). Dr. Sadlier’s opera credits include appearances with Chicago Opera Theater, Glimmerglass Opera, Opera Theatre of St. Louis, New Orleans Opera, Baltimore Concert Opera, Opera Circle of Cleveland, and Opera North. Fortunate to be involved in many new works, Dr. Sadlier has performed several world premieres including Loss of Eden (Opera Theater of St. Louis), the title role in Thamos: King of Egypt (Opera Circle of Cleveland), and Our Town and the collegiate debut of A View From the Bridge (Indiana University). Most recently, Dr. Sadlier returned to Opera Circle of Cleveland as Edrisi in Szymanowski’s Krol Roger where he also performed Tebaldo in I Capuletti e i Montecchi, and the role of Fritz Kobus in L’Amico Fritz. 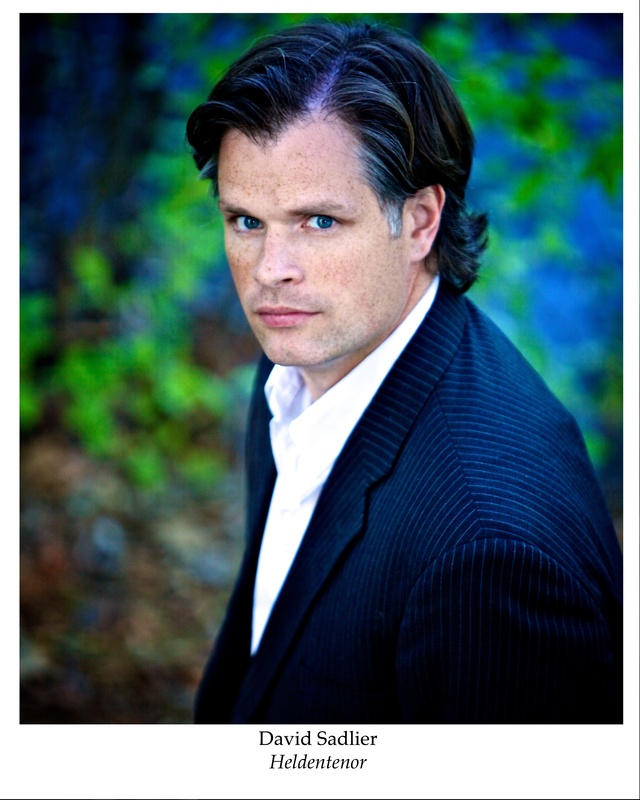 In addition, the tenor covered the role of Siegmund in Virginia Opera’s 2011 production of Die Walküre. Concert appearances include Britten’s Serenade under the baton of Richard Hughey, Mozart’s Requiem with the Battle Creek Symphony, Britten’s Saint Nicolas with the Kokomo Symphony Orchestra, Haydn’s Lord Nelson Mass and Brahms’ Liebeslieder Walzes with the Lafayette Bach Chorale, and Vaughan Williams’ Serenade to Music with the Indianapolis Symphony. Equally at home on the recital stage, Dr. Sadlier and his collaborator and wife, Dr. Lelia Sadlier, have performed many major works including Die schöne Müllerin, Dichterliebe, An die ferne Geliebte, On Wenlock Edge, and Finzi’s Oh fair to see. The duo recently made their debut recital performance at The Church of St. Martin in the Fields, London. Upcoming engagements include Handel’s Messiah with the Virginia Symphony, Spoletta in Tosca with the Lyric Opera of Baltimore, and several concert engagements with the Valley Symphony Orchestra. Dr. Sadlier currently serves as Assistant Professor of Voice at The University of Texas – Pan American where he teaches Applied Voice. Before his work at UTPA, Dr. Sadlier has been a member of the music faculties at Christopher Newport University, Baylor University, and Taylor University. He has taught Studio Voice, Opera Workshop, Foreign Language Diction, and served as both an operatic stage director and conductor. Dr. Sadlier’s students have distinguished themselves as winners of regional competitions, and through admittance to nationally and internationally recognized summer training programs and leading graduate programs such as the Manhattan School of Music , the University of Michigan, the New England Conservatory, the Bard School of Music, and the Jacobs School of Music at Indiana University. Dr. Sadlier continues to serve as a guest clinician and recitalist at universities and institutes throughout the country; most recently at Radford University, SUNY Geneseo, the Interlochen School for the Arts, Montana State University, Western Illinois University, Albion College, and the Baldwin-Wallace Conservatory. In the summer of 2011, Dr. Sadlier founded The Cornish American Song Institute (CASI) based in Falmouth, Cornwall, UK. The Institute is a two-week study of art-song for singers, pianists, composers, and, beginning in 2012, string players and woodwinds. The Institute provides applied music lessons, musical coachings, English Music Classes, several tours of Cornwall, and several concerts. In addition, CASI offers a four day residency in Oxford and the opportunity to engage in lectures and master classes with Oxford faculty. Dr. Sadlier earned the Doctor of Music degree from the The Jacobs School of Music at Indiana University where he continues to study with Andreas Poulimenos. While at IU he served as an Associate Instructor of Voice for four years. Dr. Sadlier also holds a Masters degree in vocal performance from Indiana University as well as a Bachelor of Music from Loyola University in New Orleans. Dr. Sadlier is married to, Dr. Lelia Molthrop Sadlier, with whom he regularly appears in recital. The couple has two daughters, Ada Morgan and Bronwyn McFarlane.